Studies in many model systems have shown that canonical signaling through the pathway downstream of ligands of the Wnt family can regulate multiple steps in organogenesis, including cell proliferation, differentiation, and lineage specification. In addition, misexpression of the Wnt-family member Wingless in Drosophila imaginal disc cells can lead to transdetermination of progenitors from one lineage to another. 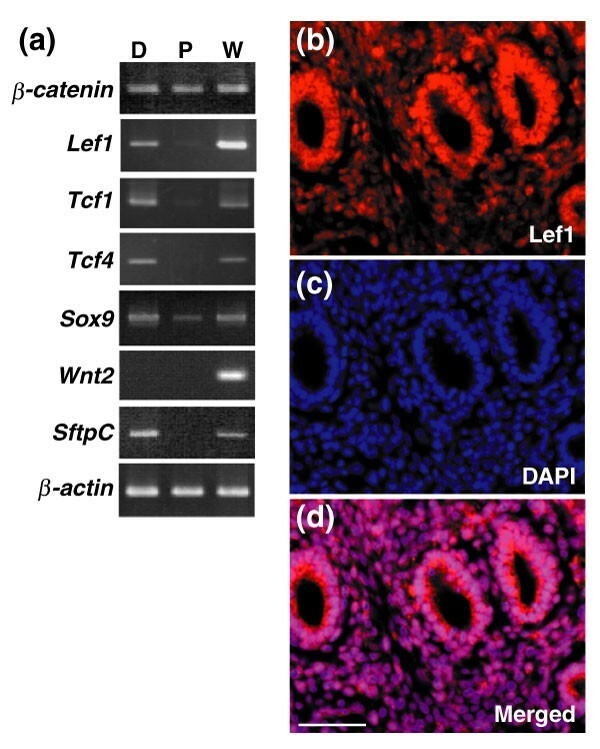 Conditional deletion of the β-catenin component of the Wnt signaling pathway has indicated a role for Wnt signaling in mouse lung endoderm development. The full range of effects of this pathway, which includes the transcription factor Lef1, has not been explored, however. To explore this issue, we expressed a constitutively active β-catenin-Lef1 fusion protein in transgenic embryos using a lung-endoderm-specific promoter from the surfactant protein C gene. Transgenic lungs appeared grossly normal, but internally they contained highly proliferative, cuboidal epithelium lacking fully differentiated lung cell types. Unexpectedly, microarray analysis and in situ hybridization revealed a mosaic of cells expressing marker genes characteristic of intestinal Paneth and goblet cells and other non-lung secretory cell types. In addition, there was strong ectopic expression of genes such as Cdx1 and Atoh1 that normally regulate gut development and early allocation of cells to intestinal secretory lineages. Our results show that hyperactive Wnt signaling in lung progenitors expressing a lung-specific gene can induce a dramatic switch in lineage commitment and the generation of intestinal cell types. We discuss the relevance of our findings to the poorly understood pathological condition of intestinal metaplasia in humans. The development of organs such as the lung, pancreas, and intestine proceeds through distinct stages, each coordinated by sets of conserved intercellular signaling pathways. Initially, an organ primordium is established within a larger embryonic field. This is followed by the proliferation of progenitor cells, their diversification into different lineages, cell differentiation, and the sequestration of organ-specific stem cells in distinct niches. In the adult, these stem cells give rise to new progenitors that normally differentiate along the same tissue-specific lineage pathways. Occasionally, however, a process known as metaplasia can occur, usually in response to local inflammation or injury. Under these conditions, cell types specific for a different organ arise in situ. A well-known example in humans is Barrett's esophagus, in which epithelial cell types characteristic of the small intestine differentiate ectopically in the lower esophagus [1, 2]. Despite the medical relevance of this and other metaplastic conditions, little is known about the underlying mechanisms and whether they involve changes in the lineage specification of progenitors and/or stem cells, a process known as transdetermination. Insight is likely to come from greater knowledge of the pathways regulating normal lineage commitment and differentiation in embryonic epithelia, including the esophagus, intestine, pancreas, and lung, all of which are derived from foregut endoderm [3, 4]. One intercellular signaling pathway that is involved at multiple stages in organ development in both vertebrates and invertebrates is the canonical Wnt signaling pathway. Initiated by the interaction between extracellular Wnt ligands and their receptors, this pathway culminates in the stabilization of β-catenin, which then interacts with nuclear T-cell factor/lymphoid enhancer factor (TCF/LEF) transcription factors to modulate the activity of target genes . In Drosophila development, depending on the cellular context, the Wnt homolog Wingless (Wg) can regulate cell proliferation, embryonic patterning, and/or differentiation. Of particular relevance to the findings of this article, Wg can drive transdetermination of third instar larval imaginal disc cells (reviewed in ). For example, ectopic expression of Wg in leg imaginal discs induces, in a subset of proliferating cells that co-express other signaling pathway components and competency factors, the expression of selector genes specific for wing imaginal disc progenitors. The descendants of these cells subsequently differentiate into wing cell types. 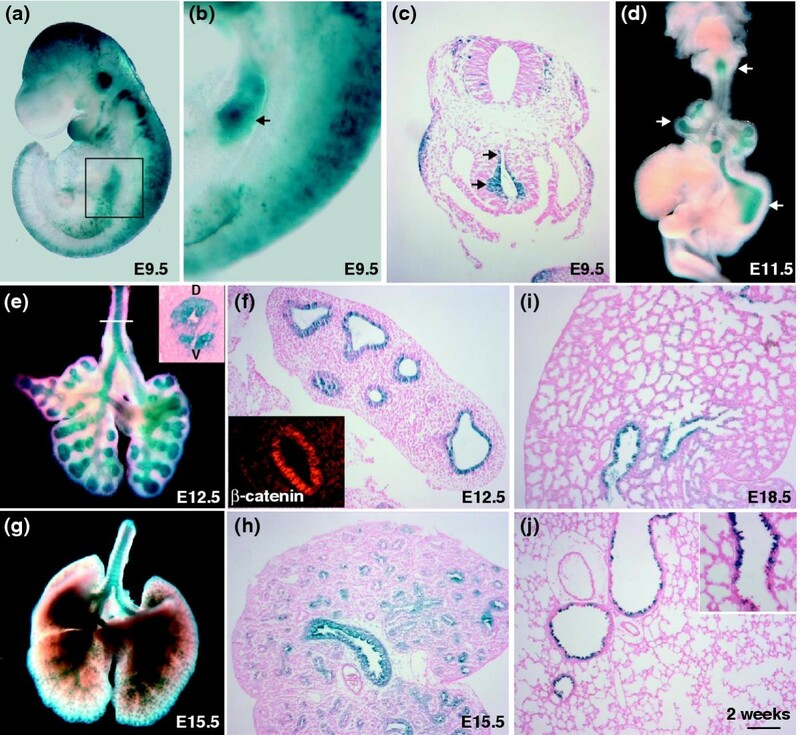 Studies in the vertebrate embryo have identified multiple roles for components of the canonical Wnt pathway in organ development. For example, in the small intestine, Tcf4 is required for the rapid proliferation of the embryonic intervillus epithelium that gives rise to the crypts . These contain the stem cells of the adult intestine, which generate the progenitors of the major epithelial cell types. Lineage choice among these progenitors is thought to involve signaling via the Notch/Delta pathway and the expression of so-called neurogenic basic helix-loop-helix (bHLH) genes. Cells transcribing high levels of Notch and Hes1 give rise to enterocytes, while descendants of cells that express high levels of Delta and the bHLH gene Atoh1 (Math1) keep their options open and undergo further rounds of lineage restriction to generate secretory cell lineages (Paneth, goblet, and neuroendocrine cells) . Blocking Wnt signaling in the intestine inhibits both cell proliferation and the generation of secretory cells [7, 9]. This abnormal phenotype is accompanied by the down-regulation of Atoh1 (Math1), consistent with the phenotype of Atoh1-null mice, which also lack all secretory cell lineages in the intestine . Much less is known about either Wnt signaling or lineage diversification in the embryonic lung. This organ arises in the ventral wall of the foregut tube between the thymus and the stomach. The trachea and primary bronchi develop by separation from the future esophagus, while the remaining respiratory tree develops from two small ventrolateral buds (for reviews see [10, 11]). These buds proliferate rapidly and undergo reiterative branching to generate an arborization of epithelial tubes of decreasing diameter. The epithelium in the larger, more proximal tubes differentiates into several specialized cell types (ciliated cells, the various subsets of secretory Clara cells, and the pulmonary neuroendocrine cells). The epithelium of the smaller, peripheral tubes that appear towards the end of gestation gives rise to the distal alveolar cell types - the type I and type II cells. Genetic studies have shed some light on mechanisms underlying lung lineage diversification. For example, as in the intestine, the bHLH gene Ascl1 (Mash1) is required for the development of lung neuroendocrine cells, while Hes1 apparently promotes non-neuroendocrine lineages [12, 13]. However, Atoh1 (Math1) is not expressed during lung development ( and our unpublished observations) and it is not known what regulates the generation of ciliated, Clara and mucus-producing cells. With respect to the Wnt signaling system, a number of Wnt ligands and receptors are expressed dynamically during lung development . For example, Wnt7b is transcribed in the distal endoderm during branching morphogenesis, while Wnt2 is expressed in the adjacent mesoderm ( and our unpublished observations). Transcription factors of the TCF/LEF family are also expressed in the developing lung, both in the endoderm and mesoderm . Although the submucosal glands that arise from epithelial cells in the trachea and main bronchi are absent from Lef1-/- mice, the respiratory portion of the lung develops normally, suggesting that other factors can compensate for the absence of Lef1 . Recently, an inducible transgenic system was used to delete β-catenin in the epithelium at different times during lung development . Although the β-catenin protein persisted for some time, its eventual depletion resulted in a dramatic down-regulation of the number of differentiated distal alveolar epithelial cells in the lung before birth, and an increase in the relative proportion of proximal ciliated and Clara cells. The experiments described here were initially designed to explore Wnt function in lung development using the complementary approach of pathway overexpression. We used the same lung epithelial cell-specific promoter as Mucenski et al. ; it is active from the time the primary buds first appear. We employed an activated β-catenin-Lef1 fusion protein that had previously been used to rescue embryonic expression in Wnt3a-null mouse mutants . We found that transgenic lungs looked grossly normal but contained rapidly proliferating epithelium and a relative paucity of fully differentiated pulmonary cell types. Unexpectedly, use of Affymetrix array analysis to study gene expression revealed very high levels of expression of multiple genes normally characteristic of intestinal epithelial secretory cell types (small intestine, duodenum, and stomach). This finding was confirmed by in situ hybridization. In addition, transgenic epithelium ectopically expressed genes such as Cdx1, which regulates gut development, and Atoh1, which is required for the determination of the secretory lineage in the intestine. These results provide strong evidence that the developmental fate of early lung progenitor cells can be switched in vivo to that of gut/intestine by elevated and/or prolonged Wnt signaling. We discuss this finding in the light of previous examples of transdetermination in response to abnormal Wnt signaling and its relevance to the pathological condition of intestinal metaplasia in humans. As there was no information available about the localization of Wnt signaling in the developing lung, we first analyzed embryos of the TOPGAL reporter mouse line, in which LacZ activity is regulated by multiple TCF/LEF binding sites linked to the minimal c-fos promoter (TCF/LEF optimal promoter)  (Figure 1). At embryonic day 9.5 (E9.5), positive cells are detected in the ventral foregut endoderm, in the region of the future trachea, and in nascent lung buds. At E11.5-E12.5, the highest expression in the lung is in the distal endoderm, with stronger LacZ staining in some cells than in others (Figure 1). This pattern of activity is associated with localization of nuclear β-catenin (Figure 1f). LacZ staining is also detected at this time in the dorsal epithelium of the trachea, and in the esophagus and stomach (Figure 1 and data not shown). By E15.5, TOPGAL activity declines in the peripheral lung tubules but remains elevated in the more proximal endoderm. Expression continues in this population at E18.5, but by postnatal day 15 it is confined to small clusters of epithelial cells in the bronchi and bronchioles. Expression of β-galactosidase in TOPGAL embryos shows dynamic changes in Wnt signaling during lung development. (a) Intact embryo at embryonic day 9.5 (E9.5). (b) High magnification of the region boxed in (a); the arrow marks a primordial lung bud. (c) A section of E9.5 embryo showing expression in the primordial lung bud and undivided trachea/esophagus (arrows). (d) At E11.5 expression is seen in the anterior trachea, distal lung buds and anterior stomach (arrows). (e) E12.5 whole lung, with a white line showing the level of section of the trachea in (f); the inset shows expression in the dorsal tracheal endoderm (D) and ventral mesoderm (V). (f) Section of E12.5 lung, at the position shown by the white line in (e). Note the heterogeneity of staining intensity in the endoderm. The inset shows immunolocalization of β-catenin in the nuclei of distal epithelial cells. (g) E15.5 whole lung. (h) Section of E15.5 lung, showing decreased expression in distal tubules. (i) Section of E18.5 lung, showing expression confined to the bronchi and bronchioles. (j) Section of postnatal (2 weeks) lung; the inset shows a higher magnification of the positive cells near the bronchiolar/alveolar junction. At all stages described here, non-transgenic tissue was negative for endogenous β-galactosidase activity. Scale bar, 100 μm (j) also applies to (c,f,h,i). Previous studies had shown that several TCF/LEF proteins are expressed in lung endoderm early in development . To confirm these findings, we carried out reverse-transcription-coupled (RT)-PCR using RNA extracted from E11.5 distal and proximal endoderm, dissected free of mesoderm. As shown in Figure 2a, β-catenin is expressed in both cell populations, while Tcf1, Tcf4, and Lef1 transcripts are all detected at higher levels distally than proximally, although their precise levels of expression cannot be quantitated using this technique. Immunohistochemistry with an antibody to Lef1 confirmed localization of the protein in the distal epithelium of the lung at E14.5 (Figure 2b-d). Expression of TCF/LEF-family genes in E11.5 lung endoderm. (a) RT-PCR analysis of TCF/LEF family genes in distal and proximal endoderm. E11.5 lungs were collected, dissected into trachea and primary bronchi (proximal region), and the remainder (distal region) and endoderm was separated from mesoderm using enzymatic treatment. Total RNA isolated from whole lungs (W) and proximal (P) and distal (D) endoderm was used for RT-PCR. The absence of Wnt2 RNA from the endoderm fractions confirms the removal of the mesoderm. (b-d) Lef1 protein is localized in the nuclei of lung epithelial cells at E14.5 (b), and nuclei are also stained with DAPI (c). The images are merged in (d); the bar is 50 μm. To explore the role of Wnt signaling in lung endoderm we expressed a constitutively active amino-terminal-deleted-β-catenin-Lef1 fusion protein (CatCLef1)  in the epithelium, using the 3.7 kilobase human surfactant protein C (SftpC) gene promoter . The CatCLef1 fusion protein functions in vitro as a transcriptional activator, and cleanly rescues the abnormal tail phenotype of Wnt3a-null mouse embryos . The SftpC promoter drives transgene expression specifically in the lung endoderm, first in progenitor cells of the primary lung buds, but not the trachea, and later at higher levels in the type II alveolar cells and their progenitors. The early expression of the promoter in distal lung buds was confirmed in our hands using an SftpC-Cre transgenic line crossed with the Rosa26R reporter line (see Additional data file 1, Figure S1). A total of seven SftpC-CatCLef1 transgenic E18.5 lungs showed both an abnormal phenotype and expression of the transgene (Figure 3). Externally, transgenic lungs appeared relatively normal, if somewhat smaller, with well-formed tracheae, two main stem bronchi and the correct number of lobes. Internally, however, a few wide-bore bronchial tubes opened directly into large sacs lined with simple cuboidal or columnar epithelium. No morphologically differentiated type II alveolar cells, normally marked by the presence of lamellar bodies, or attenuated type I cells closely apposed to capillary vessels, were seen by transmission electron microscopy (not shown); rather, the transgenic epithelial cells were cuboidal or columnar and the majority examined had large cytoplasmic accumulations of glycogen (Figure 3m). This grossly abnormal phenotype was considered to be incompatible with postnatal survival, so no pups were taken to term. In vivo labeling of E18.5 lungs with 5-bromo-2-deoxyuridine (BrdU) for one hour revealed many proliferating cells throughout the transgenic epithelium (Figure 3h,i). In addition, more than 10-fold higher proliferation was measured in the bronchial epithelium of transgenic lungs than in control bronchi of about the same diameter (Figure 3h,i, and quantitative data in Additional data file 1, Figure S2). No obvious signs of abnormal cell death were seen. The morphology and phenotype of transgenic lungs. (a) Control E18.5 lung and (b) transgenic lung, with normal-appearing tracheae and lobulation pattern. Sections of (c) wild-type lung, and (d,e) two transgenic lungs, after staining with hematoxylin and eosin. Expression of the transgene is detected by in situ hybridization with a probe for rabbit β-globin intron in (f) wild-type and (g) transgenic lung. Cell proliferation was assayed by immunostaining for incorporated 5-bromo-2-deoxyuridine (BrdU) in (h) control and (i) transgenic lung. The insets show typical bronchiolar epithelium. Quantitation showed a 10-fold higher ratio of labeled to unlabeled nuclei in the transgenic embryos (see Additional data file 1, Figure S2). Thin sections (500 nm) of (j) control and (k) transgenic lung, after staining with ethylene blue, reveal a uniform, cuboidal/columnar epithelium in the transgenic sample. Electron microscopy shows the ultrastructural morphology of (l) wild-type lung shows typical alveolar type II cells, secreted surfactant protein (SP) and a red blood cell in a capillary (RBC). (m) Transgenic lung shows cuboidal cells with microvilli (M) and stored glycogen (G). Scale bar, 200 μm (c,d,e); 50 μm (f-i). 20 μm (j,k); magnification in the original films is 3,200×. We next assayed for the localized expression of genes characteristic of the major differentiated lung epithelial cell types. 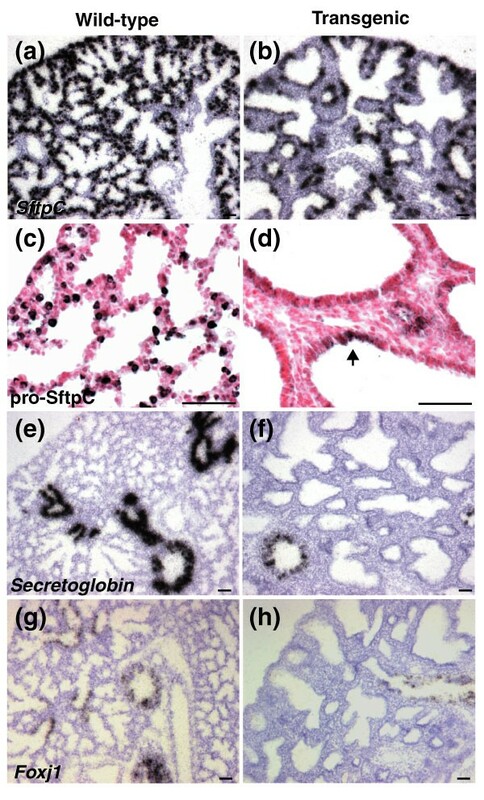 The presence in wild-type lungs of numerous differentiated type II cells with a typical rounded morphology was confirmed by in situ hybridization with a probe for StpfC RNA, and immunohistochemistry for Pro-SftpC protein (Figure 4 and see below, Figure 7). Transgenic lungs also showed high levels of SftpC expression, both in the peripheral epithelium and in patches of cells internally. The cells that reacted positively to staining with Pro-SftpC antibody were cuboidal rather than rounded, however, suggesting that they were immature type II cells (Figure 4 and see below, Figure 7). When bronchi of about the same diameter were compared for the expression of secretoglobin (Scgb1a1 or Cc10), a marker for Clara cells, and Foxj1, a marker for ciliated cells, there were clearly fewer Clara cells in the epithelium of the transgenic than in wild-type. Staining sections with an antibody to α-calcitonin/calcitonin-related polypeptide (Calca or Cgrp) showed a few clusters of differentiated pulmonary neuroendocrine cells in both wild-type and transgenic bronchial epithelium, but the numbers were too small for any meaningful comparisons at this level of analysis (data not shown). Down-regulation of lung epithelial differentiation markers. 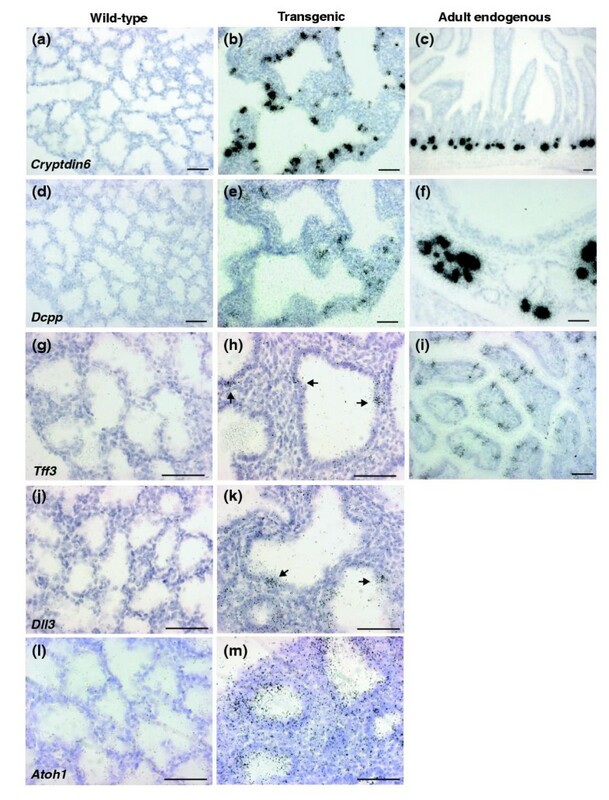 Sections of E18.5 (a,c,e,g) wild-type and (b,d,f,h) transgenic lungs after (a,b,e-h) in situ hybridization or (c,d) immunohistochemistry. (a,b) Expression of SftpC (type II cell marker gene). (c,d) Pro-SftpC is strongly expressed in (c) normal, rounded type II cells but in (d) transgenic lungs it is only expressed at low levels in some cuboidal cells (arrow). Expression of Secretoglobin (Scgb1a1 or Cc10; Clara-cell marker gene) is normal in (e) wild-type bronchioles but is reduced in (f) the transgenic lung. The expression of Foxj1 (ciliated-cell marker gene) is slightly diminished in (h) the transgenic lung relative to (g) the wild-type bronchiole. Scale bars, 50 μm. Taken together, these initial studies demonstrated that misexpressing CatCLef1 in the embryonic lung epithelium leads to the accumulation of proliferating epithelial cells that do not express morphological or molecular features of differentiated lung epithelial lineages. Fully differentiated type II and type I alveolar cells are absent, and the relative number of cells expressing markers of bronchial lineages (ciliated cells and Clara cells) is reduced. To learn more about the phenotype of SftpC-CatCLef1 lungs, we analyzed gene expression using the mouse MOE430 Affymetrix microarray set. RNA was isolated from the caudal lobe (endoderm and mesoderm) of three different transgenic and wild-type lungs, and probes were prepared according to standard protocols (see Materials and methods). A total of 1,089 genes were detected that gave more than a two-fold difference in expression between transgenics and controls, with a p value of less than 0.05 (up-regulated, 513; down-regulated, 576). They were categorized into different functional groups, and some are shown in Table 1. (The full data set can be accessed at our website  or in Additional data files 2-4). For details of the Affymetrix GeneChip mouse 430A array analysis, which used RNA from three transgenic and three wild-type E18.5 lungs, see Materials and methods. Only selected genes taken from categories discussed in the text are shown. For the complete set of genes up- or down-regulated more than two-fold, and for the raw data, see Additional data files 2, 3 and 4. Consistent with the morphological findings, the microarray data showed that genes characteristic of differentiated pulmonary cells were markedly down-regulated (Table 1). For example, aquaporin 5, a marker of type I alveolar cells, was reduced 96-fold, and genes encoding surfactant proteins (SftpA, SftpD and StfpB) and lysozyme, characteristically expressed at high levels in type II cells, were reduced between 10- and 30-fold. Transcripts for Scgb1a1 and Foxj1 were down-regulated 5-fold and 2.3-fold, respectively, confirming the in situ hybridization data (Figure 4). By contrast, genes associated with high rates of cell proliferation and metabolism were up-regulated: for example cyclinD2, cyclinD1, Brca1 and Rbl1, cdk4, 3-phosphoglycerate dehydrogenase (Phgdh), Myc genes (c-Myc, N-Myc and L-Myc), insulin-like growth factor binding protein 2 (Igfbp2), and eukaryotic translation initiation factor 2 (Eif2s3y). No significant change was seen in the level of RNA for SftpC, which is expressed not only in mature type II cells but also in lung progenitor cells. A number of the most highly up- and down-regulated genes were analyzed by RT-PCR, using RNA from two transgenic and two wild-type E18.5 lungs. As shown in Figure 5, this technique confirmed the differential expression seen by microarray. Comparative expression of selected genes in transgenic and wild-type lungs and different endodermal organs. (a,b) Comparison of gene expression between wild-type and transgenic lungs by RT-PCR. 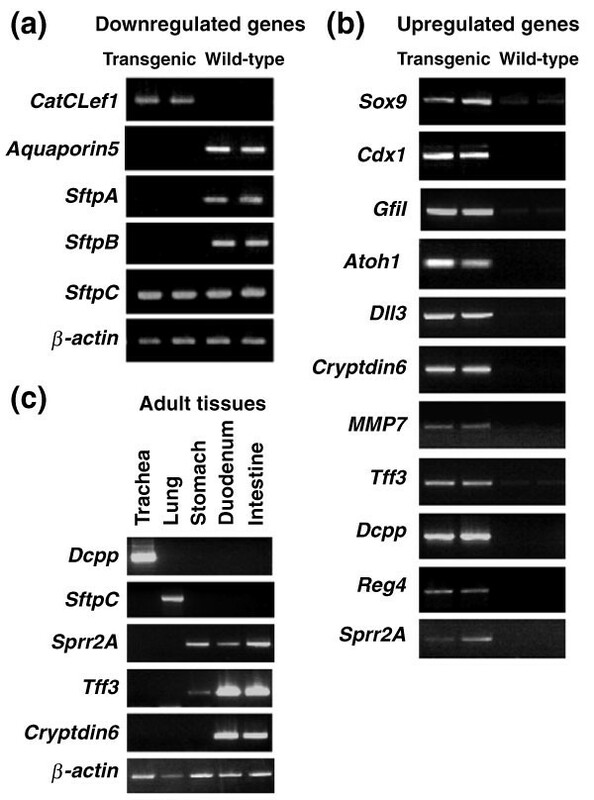 (a) CatCLef1 (transgenic fusion gene), aquaporin 5 (type I cell marker), SftpA and SftpB (both type-II-cell markers), while SftpC is also expressed in lung progenitor cells; β-actin is the control. (b) Sox9 is normally expressed in distal lung endoderm; Cdx1 is a Hox gene expressed in duodenum and intestine; Atoh1, Delta-like 3 (Dll3) and and growth factor independent 1 (Gfi1) are expressed in intestine; defensin-related cryptdin 6 (Defcr6, also known as cryptdin6) and matrix metalloproteinase 7 (MMP7) are Paneth cell markers; trefoil factor 3 (Tff3) is a goblet cell marker; Demilune cell and parotid protein (Dcpp) is a tracheal submucosal gland marker; Reg4 is an intestinal epithelial marker; small proline rich protein (Sprr2A) is expressed in the stomach, duodenum, and intestine. (c) Expression of selected genes in adult organs. A striking feature of the microarray data was the high expression in transgenic lungs of genes normally associated with the specification and differentiation of gut/intestinal secretory cell lineages. In particular, there were very high absolute levels of transcripts characteristic of Paneth cells, normally located in the base of crypts of the small intestine and absent from the lung [23, 24]. Paneth-cell-associated genes include α-defensin-related cryptdin genes (up-regulated between 3.4- and 844-fold, depending on the particular gene), guanylate cyclase activator 2 (Guca2; 322-fold), Spink4 (100-fold), matrix metalloproteinase 7 (MMP7; 9-fold) and Pla2g2e (8-fold; see Table 1). In addition, the gene encoding trefoil factor 3 (Tff3), which is initially expressed at E14.5 in stomach and intestine and at high levels postnatally in intestinal goblet cells (Figure 6), was increased 12-fold. Two other genes are normally excluded from the lung but transcribed in other tissues: ectodermal-neural cortex 1 (Enc1; 4-fold) in the intestinal crypts; and Sprr2a (34-fold) in stomach, duodenum, and intestine  (Figure 5). Also up-regulated was a subset of the genes normally expressed in neuroendocrine cells: neuropeptide Y (Npy; 7.2-fold) and calcitonin-related polypeptide α (Calca; also known as Cgrp; 5-fold). Localization by in situ hybridization of cells expressing non-lung-specific marker genes. Sections from E18.5 (a,d,g,j,l) wild-type and (b,e,h,k,m) transgenic lungs and from (c,f,i) adult organs were hybridized with the probes indicated. (b, e) Adjacent 7 μm thick sections (for a third adjacent section hybridized with SftpC riboprobe see Additional data file 1, Figure S3. Cryptdin6 is transcribed at high levels (b) by small groups of cells scattered throughout the transgenic epithelium and (c) in Paneth cells at the base of adult intestinal crypts. No expression is seen in (a) normal lung. Dcpp is expressed in (e) transgenic lungs, and by (f) most cells of the submucosal glands of the adult upper trachea but not in (d) wild-type lung. Tff3 RNA is also detected within (h) the transgenic epithelium (arrows) and in (i) the endoderm of intestinal villi. Deltalike3 (Dll3) is ectopically expressed at lower levels in (k) transgenic lung (arrows). Silver grains in the lumen are due to the scatter of 3 particles from the 35S isotope. Scale bars, 50 μm. Up-regulation was not confined to genes characteristic of the intestinal endoderm. For example, the gene Dcpp, encoding demilune cell and parotid protein, was very active in transgenic lungs (285-fold change). As its name suggests, Dcpp is known to be active in sublingual and salivary glands, which are not of endodermal origin. We show here (Figures 5,6) that the RNA is also localized in the submucosal glands arising from the proximal mouse tracheal epithelium. In addition to markers of differentiated cells, the microarray data also revealed the up-regulation of genes encoding neurogenic (bHLH) and other transcription factors that play critical roles in the earlier process of lineage specification in the gut (Table 1). Of these, Atoh1, which is normally active in the progenitor cells of the intestine, is required for the generation of secretory cell lineages, and is negatively regulated by Hes1 and Notch [8, 26]. Previous studies had failed to detect significant Atoh1 expression in the normal adult lung  and this was confirmed by RT-PCR at different stages of lung development and by in situ hybridization (Figures 5,7). Gfi1 encodes a zinc-finger transcription factor that functions downstream of Atoh1 in the inner ear and is expressed in precursors of neuroendocrine cells in both the gut and the lung . With respect to the Delta/Notch signaling pathway, the microarray data recorded higher levels of activity of Ascl1 and NeuroD4 in transgenic lungs than in controls (6.1- and 5.2-fold, respectively), and increased (16.7-fold) levels of expression of Delta-like 3 (Dll3). No change was seen in the expression of Notch genes or the bHLH genes Hes1-Hes6 (hairy and enhancer of split), however, which lie downstream of Notch, although a related gene, Hey1 (hairy and enhancer of split related with YRPW motif 1) is up-regulated about two-fold. Co-localization of transcripts for Atoh1 and SftpC in epithelial cells of transgenic lungs. Sections of E18.5 (a,b) wild-type or (c-h) transgenic lungs were viewed by either differential interference (DIC; a,c,g) or fluorescence (b,d-f,h) microscopy after hybridization with probes for SftpC (revealed by FITC in green) or Atoh1 (revealed by Cy3 in red). 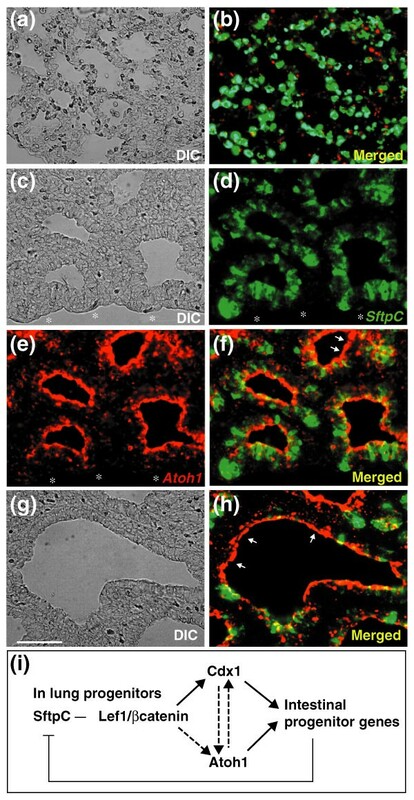 (b) Merged fluorescence images showing that in the wild-type lung SftpC is expressed in well-differentiated, rounded, type II cells. In contrast, no Atoh1 expression can be detected. (d) In the transgenic lung, SftpC, and by inference the transgene, is expressed in cuboidal epithelial cells. (e) Atoh1 is expressed in cuboidal epithelial cells. No expression is seen in mesothelial cells bordering the outer surface of the lung; the extrapulmonary region is marked by asterisks in (c-e). (f) Merged images showing co-expression of SftpC and Atoh1 in some cells. Some cells (arrows) show only Atoh1 expression. (h) Merged images of another region of the same transgenic lung show more extensive regions of the epithelium (arrows) in which only Atoh1 is expressed. Scale bar, 50 μm. (i) A model for the transdetermination of lung progenitor cells to intestinal lineages by hyperactive Wnt signaling. High levels of the Lef1/β-catenin fusion gene in lung progenitors directly induce expression of transcription factors such as Cdx1 and possibly Atoh1. These factors may also up-regulate each other. Cdx1 and/or Atoh1 promotes the respecification of the cells to intestinal secretory lineages; this would result in the down-regulation of the transgene. The levels of Lef1 RNA were about 58-fold higher in transgenic than in control lungs (Table 1). Given that β-catenin-Lef1 transcripts from the transgene (shown by RT-PCR in Figure 5) would be expected to cross-hybridize with the Lef1 probe, this gives us a rough estimate of the level of up-regulation of the Wnt signaling pathway in transgenic lungs. Finally, we examined the expression of Cdx1, a caudal-type homeodomain gene. Cdx1 is normally expressed in the duodenum and intestine, is a direct target of Wnt signaling in the proliferative compartment of the intestine, and is absent from Tcf4-mutant embryos . The increase in expression of this gene seen by Affymetrix array was not statistically significant. As shown in Figure 5 (and data not shown), however, RT-PCR gave clear evidence for up-regulation of Cdx1 in three independent transgenic lungs. We next explored the distribution of the up-regulated RNAs by in situ hybridization. As shown in Figure 6, defensin-related cryptdin 6 (Defcr6, also known as cryptdin6) is highly expressed in individual or small groups of cells scattered throughout the epithelium. This pattern is reminiscent of the distribution of Paneth cells in transgenic intestines, in which the spatial segregation of the crypt from the villus has been disrupted by the absence of EphB and EphrinB . Transcripts of Tff3 (trefoil factor 3), Dcpp (demilune cell and parotid protein) and Dll3 (Delta-like 3) genes showed similar patchy distributions, with fewer positive cells than were observed for cryptdin6. From analysis of adjacent 7 μm sections (Figure 6 and also Additional data file 1, Figure S3) it appears that cells expressing high levels of SftpC (and therefore presumably high levels of the transgene) do not co-localize with cells expressing Dcpp or cryptdin6. By contrast, Atoh1 has a broader expression pattern and transcripts were widely distributed in the transgenic epithelium (Figure 7). To test the hypothesis that Atoh1 is up-regulated in cells that express the transgene, we carried out double fluorescence in situ hybridization using probes for Atoh1 and SftpC. As shown in Figure 7, some of the cells that express SftpC also express Atoh1, but Atoh1 was also transcribed in cells that are negative for SftpC RNA. A similar conclusion was reached by analysis of adjacent 5 μm sections using radioactive in situ hybridization (Additional data file 1, Figure S4). The results presented here provide strong evidence that Wnt signaling positively regulates epithelial proliferation in the lung, as it does in the intestine. This is evident from the high rate of BrdU incorporation in transgenic lungs at E18.5, a time when cell division has normally declined, and from the up-regulation of genes associated with cell-cycle progression (Table 1). Some of these genes, for example cyclinD1 and c-Myc, are direct targets of Wnt signaling . We cannot rule out the possibility that part of the increased proliferation of transgenic epithelium seen at E18.5 is due to the action of peptide growth factors - such as parathyroid-hormone-like peptide, transforming growth factor-α (TGF-α), bone morphogenetic protein 2 (BMP2), insulin-like growth factor 1 (IGF1) or fibroblast growth factor 2 (FGF2) - and/or various chemokine receptor ligands, which were found by microarray analysis also to be expressed at elevated levels in transgenic lungs. This proviso raises the possibility that the hyperproliferation of metaplastic epithelia in human lesions is driven in part by proliferative signals that are secondary to the localized misexpression of a single signaling pathway. Our results show that high levels of Wnt signaling in lung epithelium inhibit the terminal differentiation of pulmonary-specific epithelial cell types, as judged by cell morphology and gene expression. In addition, the pattern of TOPGAL expression that we have observed supports a model in which Wnt signaling normally promotes the proliferation and/or maintenance of multipotent lung progenitor cells, a conclusion compatible with recent studies in which Wnt signaling was inhibited in lung epithelial cells by conditional deletion of the β-catenin gene . During most of the pseudoglandular stage, TOPGAL activity is highest in the undifferentiated, multipotent, and rapidly proliferating distal epithelial cell population. By E15.5, activity declines in the distal tubules that will generate only alveolar precursors but remains high in the bronchiolar/bronchial epithelial cell populations that are still diversifying into multiple cell types (ciliated cells, neuroendocrine cells, and Clara cells). Further work is required to characterize the TOPGAL-positive bronchiolar cells in the postnatal lung and to see whether TOPGAL activity is up-regulated in progenitor cells generated from putative adult airway stem cells under normal or pathological conditions (reviewed in [30–32]). The most unexpected finding of this study is the presence, scattered throughout the epithelium of SftpC-CatCLef1 transgenic lungs, of cells expressing genes characteristic of secretory cells of the gut. The evidence for this conclusion is robust, and is derived not only from gene microarray data but also from RT-PCR analysis and in situ hybridization of sections of several independent transgenic lungs. Moreover, identification of Paneth cells was achieved using several independent markers, not just α-defensin-related cryptdins. Although transcript levels were relatively high (see the microarray data in Additional data files 2-4), antibodies to cryptdins did not reveal these proteins to be localized in typical secretory granules in the E18.5 transgenic lung (data not shown). This is perhaps not surprising, however, because Paneth cells in the gut do not normally become fully differentiated until after birth, and antibody staining of E18.5 intestine failed to detect cryptdin-containing granules in cells in the base of the crypt (data not shown; note that no transgenic pups were available postnatally). The fact that the presumptive Paneth cells are scattered throughout the epithelium is consistent with observations that Paneth cells can differentiate within the villus, rather than the base of the crypts, if the organization of the crypt/villus axis is artificially disrupted by changes in Eph/Ephrin expression . The epithelium of transgenic lungs also contained scattered cells expressing trefoil factor 3, characteristic of goblet cells of the intestine. There was no apparent up-regulation of genes typical of enterocytes, however. One explanation for this lies in the observation that transgenic epithelium expressed high levels of Atoh1, which positively regulates differentiation of secretory cell lineages in the gut but does not promote specification of absorptive enterocytes. Previous studies have shown that Lef1 is required in the mouse for the development of submucosal glands from the tracheal epithelium . It might therefore have been expected that driving ectopic CatCLef1 in the primary lung buds would result in the ectopic differentiation of submucosal glands. We cannot rule out some differentiation in this direction, since Dcpp, encoding demilune cell and parotid protein, is transcribed in adult tracheal submucosal glands and is up-regulated in transgenic lungs. Neither α-defensin-related cryptdins, Tff3, nor Sprr2a were expressed in adult submucosal glands, however, leading to the conclusion that multiple gut-specific lineages are being generated in the transgenic lungs. Our results provide strong evidence that high levels of Wnt pathway activity in embryonic lung progenitor cells expressing a lung-specific gene (Sftpc) lead to the generation of intestinal progenitors that subsequently give rise to multiple intestinal and gut cell types. The distal lung epithelial cells in which SftpC is expressed are already competent to respond to elevated Wnt signaling, since they express the TOPGAL reporter. They are also transducing other intercellular signals, including those of the FGF and BMP pathways [10, 33]. We argue that in this particular cellular context, higher than normal β-catenin-Lef1 levels activate new downstream targets, including Cdx1, which encodes a homeodomain protein that is normally expressed in the duodenum and intestine and is a key regulator of midgut endoderm development. Cdx1 alone, or in combination with TCF/LEF factors, may then activate the intestinal proneural bHLH gene Atoh1. These changes lead to the transdetermination of lung progenitor cells into those committed to intestinal secretory lineages. In the inner ear, Atoh1 regulates the expression of the zinc-finger gene Gfi1 that is required for the specification of certain epithelial cell lineages . There is evidence that in the gut a similar relationship may hold (Huda Zhogbi and Hugo Bellen, personal communication), which may account for the up-regulation of Gfi1 seen in our transgenic lungs. Some variation in the level of transgene expression within the lung progenitor population may lead to different levels of CatCLef1 expression, in turn causing transdetermination to other lineages besides intestinal, for example, submucosal gland. Concomitant with transdetermination to other lineages, there is down-regulation of lung-specific genes, including SftpC and the transgene driving CatCLef1 expression. Several lines of evidence support this model, which is schematized in Figure 7i. First, there are multiple Cdx1- and TCF/LEF-consensus binding sites in the 3' untranslated region (UTR) of Atoh1 ( and data not shown). Second, Atoh1 is expressed ectopically in cells expressing high levels of SftpC (and therefore presumably the transgene) and in adjacent cells that do not. The latter are presumed to be daughter cells that have undergone transdetermination and have down-regulated the transgene. This will be tested in the future using cell-autonomous lineage labeling to follow cell fate. In addition, experiments will be designed to study the effect of transiently up-regulating the normal Wnt signaling pathway in adult lung cells, including presumptive airway stem cells and progenitor cells generated after tissue turnover or injury. One drawback of our current experimental strategy is that it involved the high-level expression of a constitutively active β-catenin transgene. But it is important to note that the transgene is likely to be down-regulated after transdetermination. Human lung tumors known as fetal adenocarcinomas and pulmonary blastomas have been associated with activating mutations in β-catenin , but global gene expression in these tumors has not been reported. Finally, our model (Figure 7i) is compatible with a number of recent reports of an association between perturbations of Wnt signaling and changes in cell lineage in the epidermis and hair follicle [36–38]. In addition, expression of constitutively activated β-catenin in secretory epithelial cells of the transgenic mammary gland or prostate [39, 40] leads to hyperproliferation and differentiation of keratinocytes (squamous metaplasia). This suggests that increased Wnt levels can promote switches to cell fates other than the intestine, depending on cellular context. Our model therefore raises the possibility that elevated Wnt signaling in adult stem cells or progenitor cells is at least one factor promoting intestinal metaplasia in humans, for example in premalignant stomach cancer or Barrett's esophagus [1, 2]. In these cases the process of transdetermination may have two components. First, stem cells are induced to proliferate in response to repeated injury or inflammation. Second, the fate of the cells may be altered in response to substantially increased expression of Wnt ligands or down-regulation of Wnt antagonists in the mesenchymal cells making up the stem-cell niche, again in response to inflammation or tissue damage. Wild-type embryos were from ICR outbred mice (Harlan-Sprague-Dawley, Indianapolis, USA). The TOPGAL mouse line was kindly provided by Elaine Fuchs . The expression vector pCGBCLAFHA including mouse full-length Lef1 fused to amino-terminally truncated β-catenin was kindly provided by Rudolph Grosschedl. The CatCLef1 fusion gene was excised with XbaI and KpnI and inserted downstream of the human surfactant protein C promoter (3.7 kb) in a vector incorporating a rabbit β-globin intron (572 bp) and 3' β-globin polyA addition signal. The 6.8 kb construct was linearized, purified, and injected into the pronucleus of one-cell (B6D2) F2 embryos at a concentration of 2 ng/ml. A total of 14 transgenic embryos were obtained at E18.5. Of these, 7 expressed the transgene as confirmed by in situ hybridization for β-globin intron sequence, and had an abnormal phenotype. This proportion was as expected from previous work with the same promoter and was presumably due to chromosome-position effects. Because of the gross abnormalities of the E18.5 lungs, which were considered to be incompatible with postnatal survival, no pregnant foster mothers were allowed to go to term. cryptdin6: 5'-ccgctcgagcggGAAGACACTAATCCTCCTC-3' and 5'-ccggaattccggTCAGCGACAGCAGAGCATG-3'; Tff3: 5'-ccgctcgagcggATGGAGACCAGAGCCCTCTG-3' and 5'-ccggaattccggCAAAATGTGCATTCTGTCTCC-3'; Dcpp: 5'-atccgctcgagcggAGATGTTCCAGCTGGAGGCC-3' and 5'-aaggaaaaaagcggccgcaaaaggaaaaTATGCCACCTGCCCTCCAAG-3'. PCR products were cloned into the pBS-KS vector and sequences confirmed. The resulting constructs, pBS-cryptdin6, pBS-Tff3, and pBS-Dcpp, were used to transcribe antisense probes using the T7 promoter. For double in situ hybridization, digoxygenin-labeled (DIG) Atoh1 cRNA and fluorescein-labeled SftpC cRNA were synthesized using DIG-dUTP and fluorescein-dUTP (Roche Applied Science, Indi-anapolis, USA), respectively. The TSA™ biotin system and the TSA™ Plus fluorescence system (Perkin Elmer, Boston, USA) were used for amplifying the signal. Small pieces of lung tissue were fixed in 2% glutaraldehyde in phosphate buffer, post-fixed in osmium tetroxide, stained en bloc with uranylacetate and embedded in Spur's embedding medium (EM science, Fort Washington, USA). Thin sections were stained with uranylacetate/lead citrate before viewing with a Philips electron microscope. Sections of paraffin-embedded lungs were stained with mouse anti-β-catenin (Transduction Laboratories, Lexington, USA), rabbit anti-pro-SftpC (Chemicon International, Temecula, USA), and sheep anti-procryptdin  antibodies and mouse monoclonal anti-LEF antibody (Upstate Cell Signaling Solutions, Lake Placid, USA). We used Cy3-labeled secondary antibody for mouse IgG (Jackson Immunoresearch, West Grove, USA) and biotinylated secondary antibody for rabbit IgG and sheep IgG (obtained from Vector Laboratories, Burlingame, USA), with the signal detected using a DAB staining kit (Vector Laboratories). For studies of cell proliferation, BrdU (Amersham Biosciences, Piscataway, USA) was injected intraperitoneally into pregnant females at a dose of 10 μl per gram body weight. After 1 h, embryos were collected and lungs fixed in 4% paraformaldehyde. For immunohistochemistry, anti-BrdU antibody (Sigma-Aldrich, St Louis, USA) was used, and non-specific binding was prevented by incubation with the blocking reagent included in the Mouse on Mouse Kit (M.O.M., Vector Laboratories). The M.O.M. biotinylated anti-mouse IgG was then added to sections, followed by avidin-biotinylated peroxidase complex. Staining was performed with DAB (Vector Laboratories) according to the manufacturer's protocol. β-actin: 5'-GTCGTACCACAGGCATTGTGATGG-3' and 5'-GCAATGCCTGGGTACATGGTGG-3'; β-catenin: 5'-CTTGGATATCGCCAGGATGATC-3' and 5'-TATCAAACCAGGCCAGCTGATT-3'; Lef1: 5'-ATGCCCCAACTTTCCGGAGGAG-3' and 5'-ATTTCAGGAGCTGGAGGGTGTC-3'; Tcf1: 5'-AGGAGGCTAAGAAGCCAGTC-3' and 5'-TAGAGCACTGTCATCGGAAG-3'; Tcf4: 5'-GGCCCTGCAGATGCAAATAC-3' and 5'-CTTGGTCACCAGAGACAGAG-3'; Wnt2: 5'-AGAGGAAAGGCAAGGATGCC-3' and 5'-TTGCATGTGTGCACGTCCAG-3'; Sox9: 5'-TGAAGAAGGAGAGCGAGGAAGATAA-3' and 5'-GGTGGCAAGTATTGGTCAAACTCA-3'; Atoh1: 5'-TTGCCGGACTCGCTTCTCAG-3' and 5'-CTAACTGGCCTCATCAGAGTC-3'; Delta-like 3: 5'-GGCTACATGGGCGTGAGATG-3' and 5'-GGCCTCTCGTGCATAAATGG-3'; MMP7: 5'-ATGCAGCTCACCCTGTTCTG-3' and 5'-CACAGCGTGTTCCTCTTTCC-3'; cryptdin6: 5'-GGCCTTCCAGGTCCAGGCTGAT-3' and 5'-TCAGCGACAGCAGAGCATG-3'; trefoil factor 3: 5'-ATGGAGACCAGAGCCCTCTG-3' and 5'-CAAAATGTGCATTCTGTCTCC-3'; Reg4: 5'-ATGGCTTACAAAGGCGTGCG-3' and 5'-CTATGTCTTATACTTGCACAG-3'; Dcpp: 5'-AGATGTTCCAGCTGGAGGCC-3' and 5'-TATGCCACCTGCCCTCCAAG-3'; aquaporin 5: 5'-AATCCGGCCATTACTCTGGC-3' and 5'-TCAGCTCGATGGTCTTCTTC-3'; SftpA: 5'-ACCTGGATGAGGAGCTTCAG-3' and 5'-ATTCACAAATGGCCAGCCGG-3'; SftpB: 5'-CTGCTGGCTTTGCAGAACTC-3' and 5'-GGTTTGGAAGCACTGCAGAG-3'; SftpC: 5'-GGACATGAGTAGCAAAGAGG-3' and 5'-GTAGAGTGGTAGCTCTCCAC-3'; Cdx1: 5'-GGACGCCCTACGAATGGATG-3' and 5'-AACTCCTCCTTGACGGGCAC-3'; Sprr2A: 5'-CGATGTCTTACTACCAGCAG-3' and 5'-TCACTTCTGCTGGCATGGTG-3'. Total RNA (10 μg) was extracted from the caudal lobe of three different wild-type and three different transgenic lungs using RNeasy and assessed for quality with an Agilent Lab-on-a-Chip 2100 Bioanalyzer (Agilent Technologies, Palo Alto, USA). Hybridization targets (probes for hybridization) were prepared from total RNA according to standard Affymetrix protocols. Briefly, first strand cDNA was synthesized using a T7-linked oligo-dT primer, followed by second strand synthesis. An in vitro transcription reaction was performed to generate the cRNA containing biotinylated UTP and CTP, which was subsequently fragmented chemically at 95°C for 35 min. The fragmented, biotinylated cRNA was hybridized in MES buffer (2-[N-morpholino]ethanesulfonic acid) containing 0.5 mg/ml acetylated bovine serum albumin to Affymetrix GeneChip Mouse 430A arrays at 45°C for 16 h, according to the Affymetrix protocol [42, 43]. Arrays were washed and stained with streptavidin-phycoerythrin (SAPE; Molecular Probes Inc, Eugene, USA). Signal amplification was performed using a biotinylated anti-streptavidin antibody (Vector Laboratories) at 3 μg/ml. This was followed by a second staining with SAPE. Normal goat IgG (2 mg/ml) was used as a blocking agent. Scans were performed with an Affymetrix GeneChip scanner and the expression value for each gene was calculated using the Affymetrix Microarray Analysis Suite (v5.0), computing the expression intensities in 'signal' units defined by the software. Scaling factors were determined for each hybridization based on an arbitrary target intensity of 500. Files containing the computed single intensity value for each probe cell on the arrays (CEL files), files containing experimental and sample information, and files providing the signal intensity values for each probe set, as derived from the Affymetrix Microarray Analysis Suite (v5.0) software (pivot files), can be found on our project web site . The analysis of the microarray data obtained from lung tissue of three transgenic and three wild-type embryos from the same litters utilized the signal intensity values generated in the Affymetrix MAS 5.0 software. Analysis was performed in GeneSpring 6.0 . The data were normalized by dividing each measurement by the 50th percentile of all measurements in that sample, and each gene was divided by the median of its measurements in all samples. If the median of the raw value was below ten then each measurement for that gene was divided by ten. The statistically significant differences were determined with an ANOVA analysis. A parametric test, variances not assumed equal (Welch t-test) was performed to identify genes that exhibited significant differences between the wild-type and transgenic samples (p < 0.05). We have recently used mice carrying a floxed allele of endogenous β-catenin to generate a stabilized form of β-catenin protein specifically in embryonic lung epithelial cells. This was achieved by crossing Catnblox(ex3)/+ mice  with a transgenic line in which Cre recombinase is expressed under the control of the Sftpc promoter. After excision of exon 3 (amino acids 5-80), the single recombined endogenous allele encodes a stabilized protein that can function in conjunction with endogenous TCF/LEF transcription factors. All embryos with a single recombined allele died soon after birth with highly abnormal lungs. Preliminary RT-PCR analysis shows that all lungs express intestinal genes, including Atoh1, Cdx1, Ttf3 and defensin-related cryptdin 4 and defensin-related cryptdin 6, and down-regulation of lung-specific genes. This result suggests that induction of a program of intestinal genes occurs in the developing lung even when the level of activated β-catenin is presumably much lower than in the experiments described in this paper. The following are provided as additional files: Additional data file 1, containing Figure S1, showing the early expression of the SftpC promoter in distal lung buds, using an SftpC-Cre transgenic line crossed with the Rosa26R reporter line; Figure S2, showing quantitation of BrdU incorporation in wild-type and transgenic lungs; Figure S3, showing in situ hybridization for SftpC, cryptdin6, and Dcpp in transgenic lungs; and Figure S4, showing in situ hybridization for SftpC and Atoh1. Additional data file 2 contains all raw data from the Affymetrix array experiments; Additional data file 3 lists down-regulated genes; and Additional data file 4 the up-regulated genes. Additional data files 2-4 are also available from the Hogan lab website . We thank Elaine Fuchs for providing the TOPGAL mice, Rudolph Grosschedl for the CatCLef1 construct, Andre Ouellette for the antibody to procryptdin and for helpful discussion, Mildred Stahlman for electron microscopy, Holly Dressman and members of the Duke Center for Genome Technology DNA Microarray Core for technical assistance and advice, and Jane Johnson, Amy Bejsovec, and Huda Zoghbi for insightful comments. We thank Kevin Tompkins for teaching T.O. transgenic techniques. Finally, we thank Molly Weaver for very generously donating RNA and for her patient advice and encouragement. This work was supported by HL71303-11.